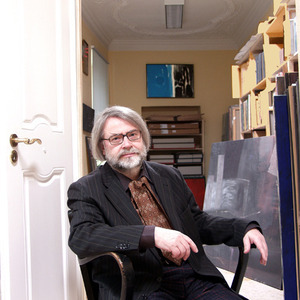 1950 born in viennaworks and lives in passauMasksI have been involved into the project "Masks" since the 1970s. More than thousand mainly brush and chalk drawings as well as sculptural objects originated. Theme is the falling back of the human being to its genetic and social history expressed in the other face. Also the art of fantasy through apparently possible shapes is an aspect.A dialog with ethnic masks developed only in the last years with Hans Jacques Keller , the Swiss mask collector.Unknown landscapesI see unknown landscapes as metaphor for making the world visible.from the catalogue "Unbekannte Landschaften - der schoene Blick taeuscht" (Unknown landscapes - the beautiful view is deceptive)Publisher Karl Stutz Passau 2002Citation:no outside no inside everything floatingin the Po Plain thinking of the Himalayalandscape loses in itselfwho penetrates the thicket, is incapable of perceiving all,but who does not penetrate, will be deceived by the standstill of the distancefrom the catalogue "Unbekannte Landschaften" (Unknown landscapes) Edition Johannes von Geymueller Essen-Werden 1999Citation:The imagination landscape is created layer by layerLandscape as interpretable surface of complex processesThe real picture of only hard to make out proceduresAesthetics of seemingly completely unclear inner structuresLandscape as suggestion of experienced (al)locationWhat is worrying me?Landscape as picture of my narrowness?Or does it even calm me?Pictures to dawnIn the early 80s I painted a series of dark pictures bringing light and shadow up to lightlessness. The picture suspended in space and time puts the contemplator into a meditative dimension producing thoughts like momentariness, transcendancy, immaterialness, etc.Around the year 2000 there were self-experiments by means of retina irritation with given light stencils. I translated the thus created image events in the inner eye - "entoptic pictures" - to painting.Currently I am working on the series dawn pictures in the broadest sense a connection to the "dark pictures". I leave the way of the light to darkness or brightness open. Basically the incitation to sophisticated, savourable perception remains in the foreground of all experiments.